This is going to be quite an interesting post if you are a Football / Soccer (oops, I'm not supposed to call it Soccer. Am I? Well, I'm including the word for SEO purpose, you know :P) fan or if you are someone who wanted to know how to create a Football / Soccer Live Scores App. Of course, you can use the same thing as base and create a Live Score Application for any other sport like Cricket / Golf / Tennis etc. – Unity Game Engine, which can be downloaded from here. 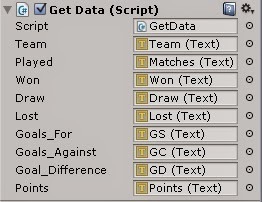 – An active account (demo/pro) on xmlsoccer.com, which will be used to fetch the live data. Once you have registered and activated your xmlsoccer.com account you will have your own API key. You can find it in the My Account section. All I can say is, we are going to use the site to get the live data like the league standings, live scores etc. If you would like to know more about the site, you can simply go through their site and read the Documentation or their wiki where in they have given the Input data formats and everything you need to know about using their site. Having said that, I won't leave everything to you guys, I mean, obviously why would I even write this post if I had to do that. Now, coming to the most important part. What would you learn in this tutorial? Well, you would learn to develop a Unity based App where in you would create a Live Standings app of the Scottish Premier League (since that is the only league data which the website is providing for free). Of course I could have created a Live scorer app instead. But, since no matches are going on right now for me to test the feasibility of the code or the post, I thought it would be better if I created an app which is capable of fetching the League Standings data from the website and displaying them in our app. The operation, as they call it as, that would fetch the league standings for us is named as GetLeagueStandingsBySeason. This operation expects three parameters as input, viz. ApiKey, league and seasonDateString. seasonDateString: 14/15, for the 2014/2015 season. 13/14 for the 2013/2014 season etc. Clicking on the above link doesn't fetch you the league standing xml, however, because you need a genuine ApiKey for that. Replace the Apikey with your own ApiKey and try it out. Once you have the xml, you would read the data from the xml using "XmlDocument" class and tabulate the data as per your requirements. To get started, created a New Unity Project in 2D mode and name it as, say, Live Standing App or perhaps, Live Score App. Create a New Folder under Assets in the Projects panel and name it as Scenes. Press ctrl+s to save the Scene that you have at the moment and name it as LiveStandingsTable and save it under the Scenes folder you created. Create Text components for displaying the league table so that they form a table. If you want to learn more about the Unity GUI, I have posted some articles on the same. You can check them out Unity New GUI Tutorial. The table which I have created is as shown in the gif below. Once you have done this, create a New Folder under the Assets in the Project panel called Scripts. Within this folder add a New C# Script. Name it as GetData. Attach the script to the Main Camera. //we are omitting some xml elements from the downloaded. Hence, some of the numbers in the grandchild nodes are missing. As the code above is well commented. I won't explain it here again. If you have any queries on the same, leave a comment below and we'll try to assist you. Save the script and return to unity. 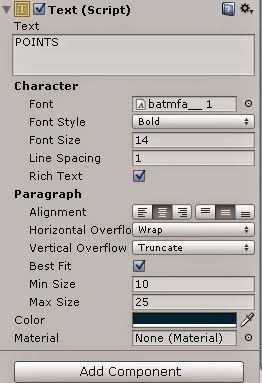 Now you will notice that the script attached to the Main Camera will expect nine Text components. Drag and drop the respective Text components which you had earlier created. Save the scene and turn on the internet if it's not on already. Test the scene by pressing the Play button on the top or simply use ctlr+p. You would notice that you now have a Simple Live Standing App which displays the League Standings of the Scottish Premier League. I'm sure you would want to add other features to this, so go ahead. Explore and turn on your thinking cap and be creative. Can you please make a code axample for getting data from XMLSoccer for a PHP user? how about if u want them to access information offline would it be possible? Hello, any advice as to how would you do it for Android? I need to create an Android app that will do very similar thing (fetch table data from external API and display it in my app). Any help would be really appreciated. Australia conquer Syria 3-2 on aggregate to reserve their spot within an intercontinental playoff against Honduras, who done 4th in North, Central and Caribbean America prior to the USA, in November. Realy ! on which platform i can create it. actualy i am not a devloper, but i know some html basic or css. Hey there, fellow games, I wanted to tell that at this site you will find a great guide on reading someone's text messages without usage of spyware! This Year 2018 in Russia Fifa World Cup 2018 | ipl schedule 2018 | ipl match list | IPL 2018 | ipl schedule |IPL Players Base Price | Sports News and Updates So Please Stay Tuned and Don’t Miss any Single Update about your favorites Match. If you want to become your own boss then why don't you learn Digital Marketing Course to boost your website or business in no time. If You want to skyrocket your buisness learn Digital marketing course in Delhi and become a leader . https://setup-microsoft-office.com- Get instant help for MS Office products. We are authorized to support provider in the USA. We will resolve your issues technical issues remotely. https://setup-microsoft-office. It really eggs on me to lead the game in next level without impediments.